Tired woman on chroma key background. Mature business woman looking exhausted and frustrated. Stress and depression concept. 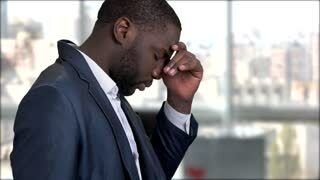 Tired dark-skinned businessman having migraine. Stressed exhausted african-american entrepreneur suffers from headache on blurred background. 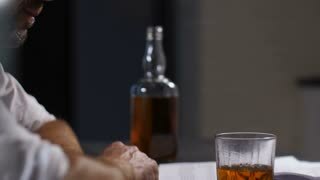 Depressed adult bearded businessman in formalwear drinking glass of whiskey while sitting at the table in dimmed domestic room. 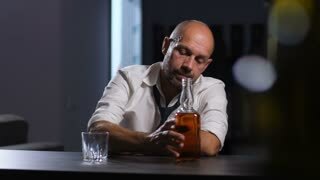 Exhausted middle aged executive finding escape in alcohol abuse at home.